Well here it is…the last recipe of 2016. How did this year fly by already? I think back and am still in awe that we drove 20 hours to our new home merely 8 months ago. Other 2016 surprises including waking up on several occasions to snow falling, camping for the first time in an actual tent with no electricity for not 1, but 2 nights! Buying my first flannel and winter coat and surrendering to the fact that I can no longer wear flip flops in December (I still have that Hawaii girl in me). But you know what….I wouldn’t change a darn thing. Now I’m not going to kvetch about 2016 as far as other news goes, because if you know me, you know I like to keep things light and casual. So to let’s toast to 2017 and bring it in classy, shall we? 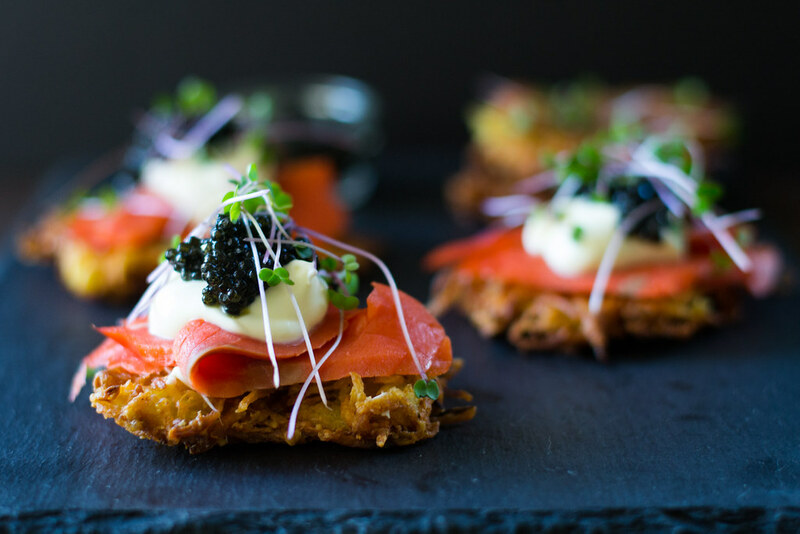 Though it’s been done a million times over, it wouldn’t be a proper New Years celebration without a spoonful of caviar. You won’t find me at any club or bar, no way in h***. Last year we tried to act like the social adults we seem to be and walked to a local bar for a drink. Half a drink in and 1 too many annoying drunk cries and shoves, we were out of there. 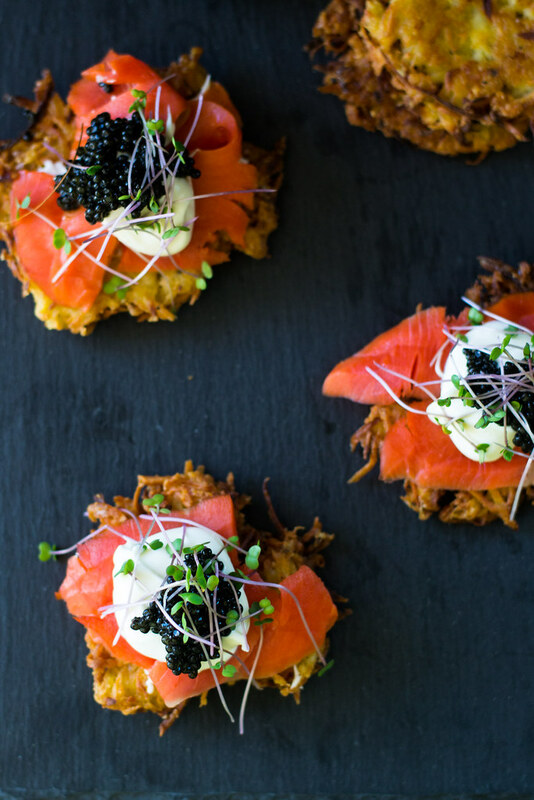 Home before midnight but long enough to open a bottle of bubbles and dollop caviar on mini parsnip latkes. The beauty of this particular year is that the last night of Hanukkah happens to fall on New Years Eve! 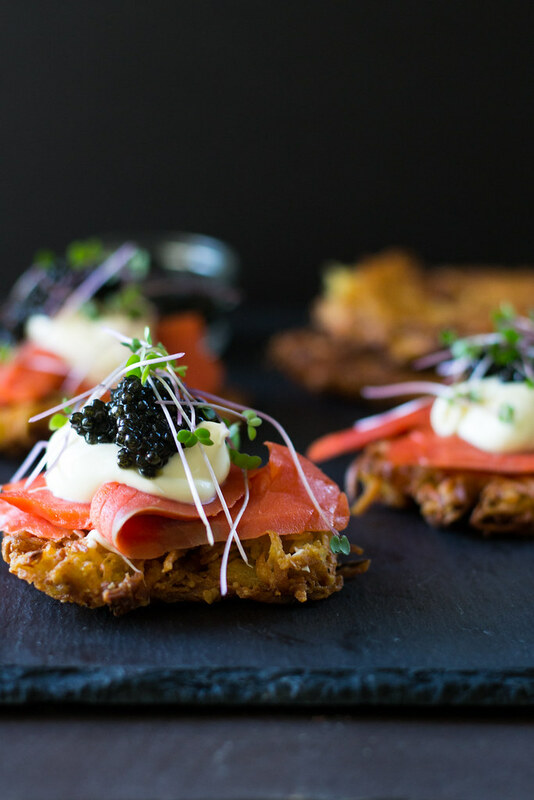 So of course you’ll be making adorable mini parsnip latkes with a gorgeous dollop of caviar. L’chaim and Happy New Year. 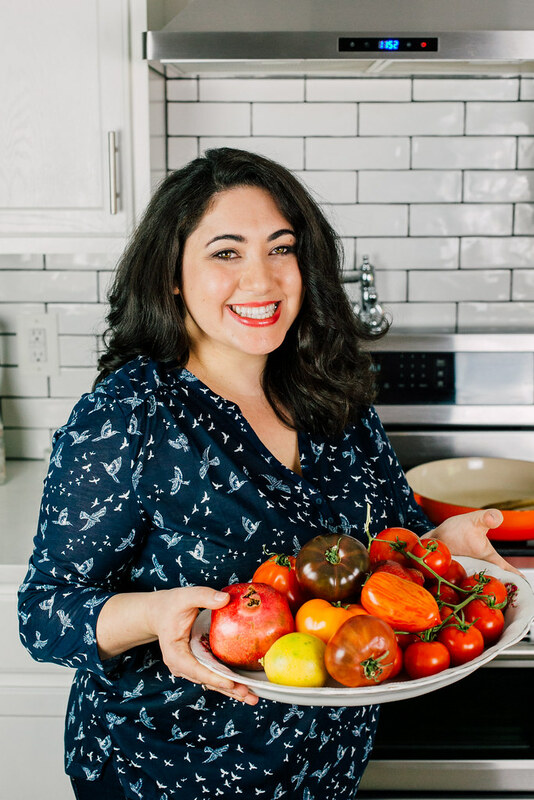 Thank you all for reading and following me on this crazy food journey. Let’s bring in 2017 as the best one yet! First make the latkes. Shred the parsnip, potatoes and onion using the shredding attachment of your food processor or shred by hand if you prefer. Use a clean kitchen towel and squeeze out as much liquid as you can, about a handful at a time. Then add vegetables to a large bowl and mix in the eggs, matzo meal and salt and pepper. Heat a large skillet over medium heat with canola oil and test with a small piece of batter to see if the oil is hot enough. If it sizzles, it's ready. Then use a teaspoon (for mini size) and spoon a mixture of the latke into the hot oil, gently pressing down so it flattens and is even and cook on first side for about 3-4 minutes. Then carefully flip over and cook the other side for another 2-3 minutes until golden brown. When done, remove to a paper towel lined baking sheet and sprinkle with salt while it's still hot. To make the creme fraiche, just mix a bit of lemon zest with the creme fraiche (or sour cream) and set aside. 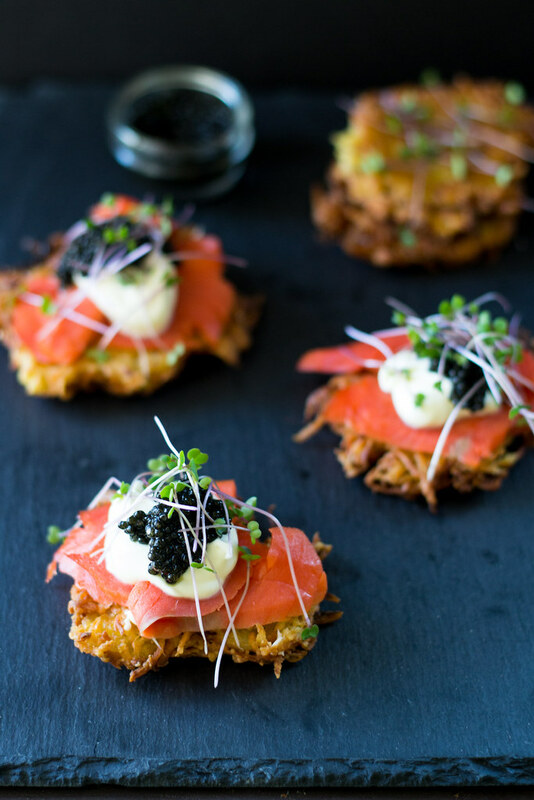 Top latke with a slice of lox, a dollop a bit of the creme fraiche, caviar and micro greens. Thanks for the inspiration Samantha! Hahah thank you so much Tara!! Thank you so much! Happy Hanukkah!